By adding another PayPal button to your view invoice screen you are able to provide the option for your clients to make partial payments towards an invoice. This can be very useful in the situation where you have customers paying off a large invoice, or you wish the client to make a deposit before the commencement of a task. 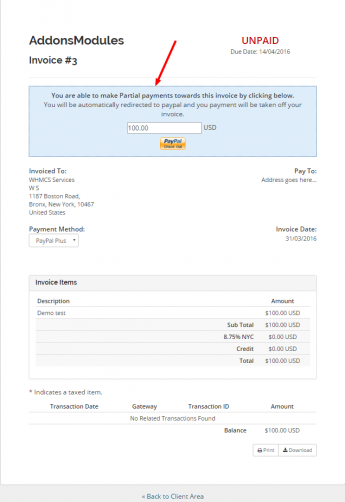 The WHMCS Admin enable that clients did like to pay partial payment. This is good when you offer web design service and they need to pay half of the amount. The plugin not works on my WHMCS. I sent a ticket 3 days ago and I don't have response.